Sonicare for Kids – Kid & Mom Approved! 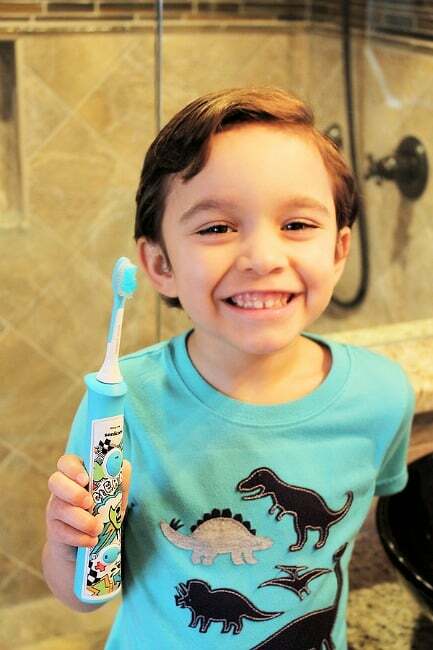 Personalization: From the get go, my son was excited about trying his new toothbrush. He was the only family member without an electric toothbrush, so instantly he felt like one of the big boys. But when he saw he could pick a sticker for the front plate, he was elated! 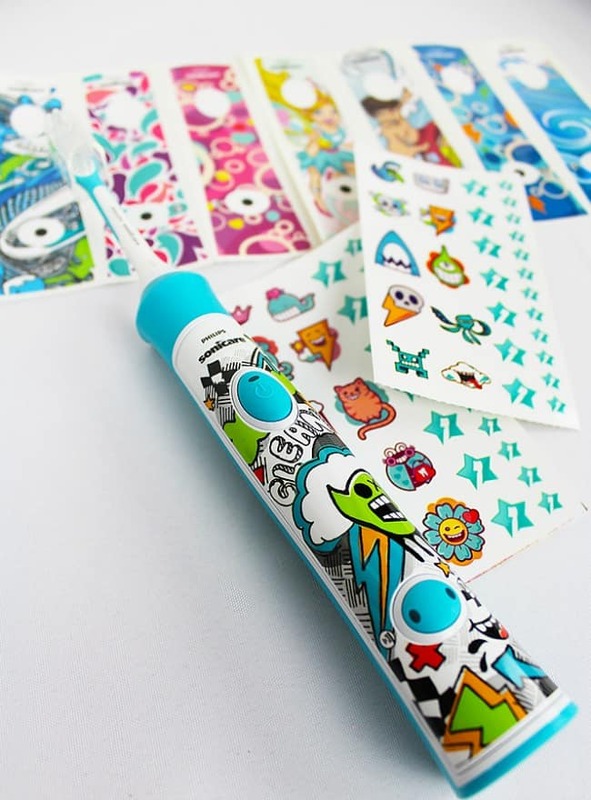 The Sonicare for Kids toothbrush comes with 8 sticker face plates to choose from along with additional stickers for more personalization. KidTimer & Kid Pacer: With the built in KidTimer, my son can no longer wiz through the tooth brushing routine. As he continues to use the toothbrush during the first 90 days, he graduates to the recommended 2-minute brushing duration. 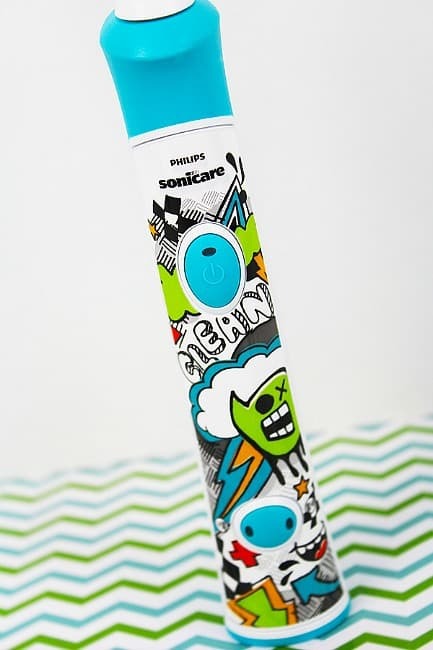 The Sonicare for Kids toothbrush also uses musical notes (KidPacer) to alert him to move to the next brushing quadrant. At the end of the complete brushing a congratulatory melody plays and the toothbrush turns off automatically. Easy Grip Handle: The handle is made specifically for little hands. Since children often apply toothpaste with two hands while laying the toothbrush down, the handle is roll free. The roll free handle keeps the toothbrush steady as my son applies a generous amount of toothpaste (which miraculously multiplies all over the counters and sink). 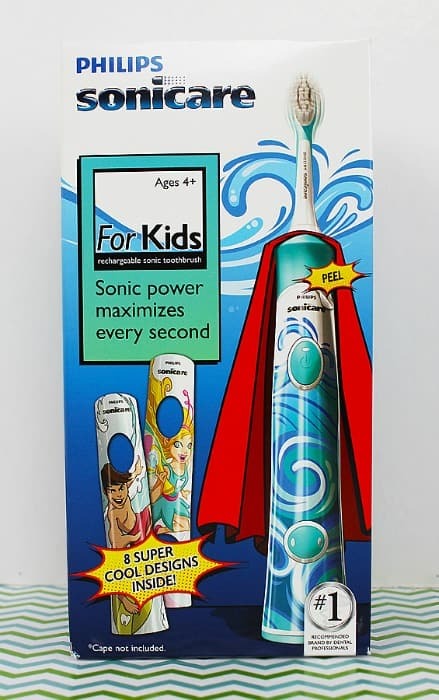 Power Modes: The Sonicare for Kids toothbrush has two power modes, low and high. The low mode is recommended for beginning brushers, which is perfect for my son. As he gets older he can move on to the high mode. 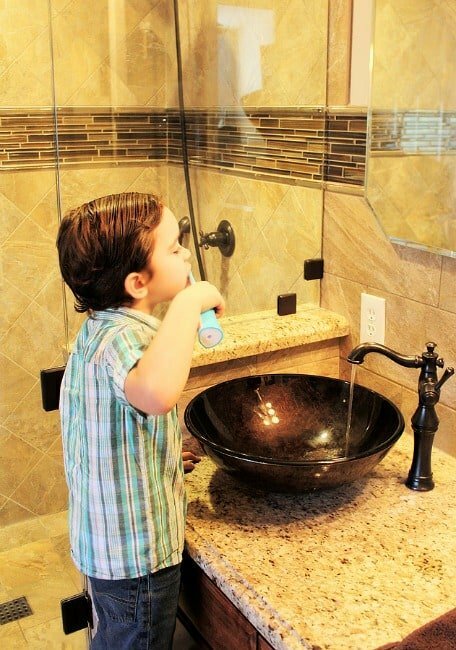 Did you know that Sonicare for Kids is 75% more effective than a manual toothbrush in hard to reach areas? 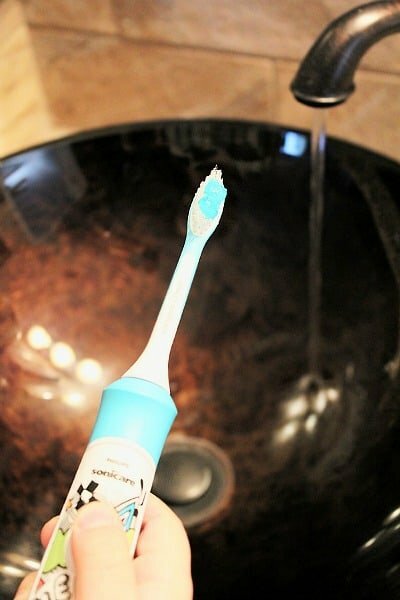 It removes 6x more plaque removal than a manual toothbrush and it alerts you when you’re brushing too hard. This is great for kids learning how to brush their own teeth. Who would have thought something as common as a toothbrush could bring peace to my morning routine? Not me! But boy am I glad we tried out the Sonicare for Kids toothbrush, it is definitely a keeper! Looking for a practical Christmas gift this year? This is one that both kids & parents will approve of! To help you with your holiday shopping, don’t forget to enter this fabulous contest for a $1000 Walmart gift card or one of 5 runner up prizes ($100 Walmart gift cards)! *Disclosure: This post is sponsored by Lunchbox. All opinions are my own. My boys LOVE this toothbrush – definitely makes it easier to have them brush. All kids need to use this toothbrush, since I don’t think they are totally efficient with the old-fashioned “manual” brushes I grew up with!